Click here for audio of Episode 207. Today, let's talk about patents and public relations. The University of Houston's College of Engineering presents this series about the machines that make our civilization run, and the people whose ingenuity created them. 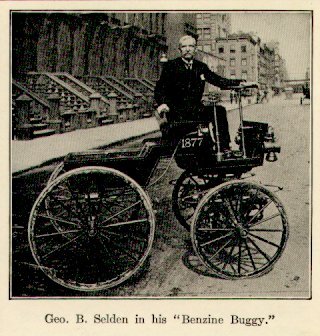 George B. Selden filed the first patent for a combustion-powered automobile in 1879. Selden was a Civil War veteran. After the War he studied engineering at Yale, where the great American Scientist J. Willard Gibbs was one of his teachers. Selden had to drop out when his father died, so he studied law and passed the bar exam in 1871. He knew his patent could protect him for only seventeen years, once it was issued. It was unlikely that he could produce cars and create a market for them that soon. Selden's abilities as both an inventor and a lawyer far outstripped his talent as a production engineer. He kept his patent alive by filing amendments that delayed its issue. Meanwhile, the Duryea brothers, Olds (of the Oldsmobile), and many others created workable cars. Duryea cars were on the market while Selden was still struggling to produce one. But in 1903 Selden's patent surfaced as a roadblock to the successful makers. One after another, they came to terms with it and paid Selden a modest royalty when they sold their cars. 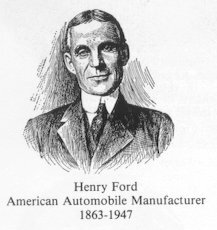 Henry Couzens, business manager for one of the lesser makers, Henry Ford, angrily told the Association of Licensed Automobile manufacturers, "Tell Selden to take his patent and go to Hell with it." Ford added, "Couzen's has answered you", and they took to the courts. There they painted the Selden patent holders as a great corporate trust that was trying to crush him. He finally won his case in 1911. By then, the thirty-year-old Selden patent looked pretty antediluvian. By then, Ford had made twenty times as much money as the so-called Selden monopoly. And that was still before he'd invented the assembly line. Olds was the first to mass-produce cars using interchangeable parts. Four years after his patent victory, Ford adapted Olds's methods in an assembly line, and he started to make money on a scale no one had ever imagined. Selden was forgotten, and Ford turned into an American legend. While I still have got breath in my lungs I will tell you what a dandy car you make. I have drove Fords exclusively when I could get away with one. For sustained speed and freedom from trouble the Ford has got ever other car skinned and even if my business hasent been strickly legal it don't hurt enything to tell you what a fine car you got in the V-8. Clyde Barrow and Henry Ford had two things in common: They were both inordinately interested in making money, and they both cultivated their images as American folk heroes. But for all that, Ford really did remake America while he was at it. This episode has been greatly rewritten as Episode 1713.